SAN DIEGO — At its Nov. 13 meeting, the San Diego Board of Port Commissioners approved a 10-year lease allowing for the berthing of the newest National Oceanic and Atmospheric Administration (NOAA) vessel, Reuben Lasker, at the Crosby Street Pier. The commission saw the opportunity as a chance to strengthen and diversify maritime business in San Diego Bay, and welcomed an ocean research vessel operated by NOAA through the U.S. General Services Administration (GSA). The lease is anticipated to create approximately 24 new jobs and generate an estimated $27 million annually in direct and indirect economic contributions. NOAA is expected to begin its 10-year lease in September 2013, with an option for five additional years. “The homeporting of NOAA’s new vessel in San Diego promotes the city’s legacy as a world leader in marine science, education, and environmental stewardship,” said port commission chairman Lou Smith. The agreement provides the port the opportunity to partner with a well-respected and globally known fisheries and oceanographic agency, and strengthens and continues the port district’s partnership with another branch of the federal government. The angling group Sportfishing Association of California (SAC) had been working for two years with NOAA and the Port of San Diego for the lease agreement, as the ship will now be able to provide information and data to the Pacific Fisheries Management Council to make decisions on local fisheries. “NOAA has been a good partner, and having this ship homeported in San Diego will reduce transit time to our region and provide this ship more time to conduct critical stock research in the California Bight,” stated a release from SAC. The agreement promotes regional partnerships with the port and organizations such as NOAA’s Southwest Fisheries Science Center, Scripps Institution of Oceanography, World Wildlife Fund, Hubbs SeaWorld Research Institute, Sportfishing Association of California and the National Marine Mammal Foundation. NOAA estimates that the vessel’s annual operating budget will be around $6 million — the bulk of which will be spent in San Diego on fuel, supplies, food and salaries. 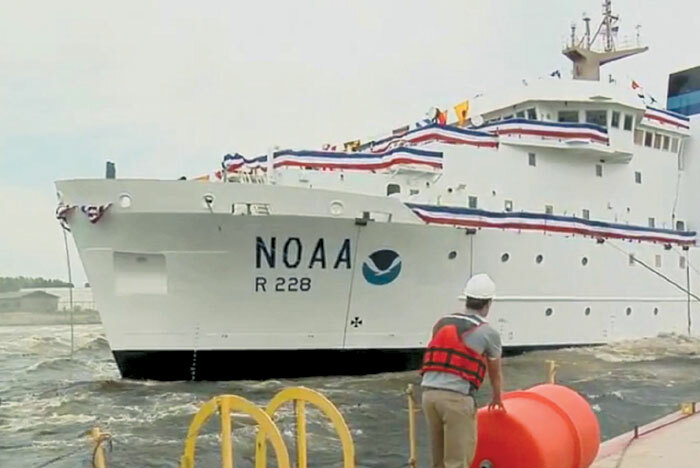 Reuben Lasker is the fifth and newest fisheries research vessel in NOAA’s fleet, equipped with the latest technology for fisheries and oceanographic research. The vessel will provide the basis for the at-sea scientific research conducted by more than 270 scientists at NOAA’s Southwest Fisheries Science Center, based in La Jolla. It will primarily support fish, marine mammal and turtle surveys off the West Coast and in the eastern tropical Pacific Ocean. “This long-term commitment by the federal government sends a strong message to the local maritime community that San Diego is a good place to do business,” said the port’s director of maritime operations Joel Valenzuela. With NOAA’s vessel being berthed at the Crosby Street pier, cargo operations at 10th Avenue Marine Terminal will not be negatively impacted, Valenzuela said. The port and NOAA are also discussing options for using the homeported research vessel for educational public outreach, including open houses and educational tours for the public. The vessel is named after the late Dr. Reuben Lasker, a fisheries biologist who served as the director of the NOAA Southwest Fisheries Science Center’s Coastal Fisheries Division and as adjunct professor at Scripps Institution of Oceanography, University of California San Diego.